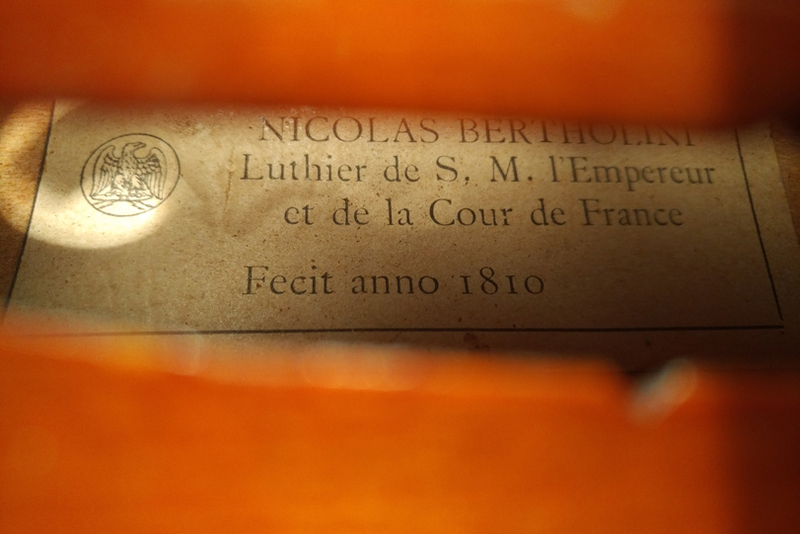 Hand-crafted in Mirecourt, a "Nicolas Bertholini" model by Laberte and labeled accordingly. Its richness of sound is remarkable! It is strong, warm, large, powerful, very diverse. In the upper areas bright, clear, open, singing - Mature and full of character, noble in the lower areas, thus strong and powerful. A powerful old French violin that responds easily and gives good players a great amount of real joy. Its appearance is - typically French - very elegant, with a particularly beautiful fluting, edgework and purfling: its pleasing warm color is a dark orange-brown varnish over a golden yellow background. Like all instruments from us, this Nicolas Bertholini violin has been worked over and set up by our violin makers and is offered in perfect condition, ready to play.